Hello, thank you for the inquiry! Unfortunately our scope of this project was just the countertops and backsplash, so I don't have the answer for you. Conceptual Kitchens are the ones responsible for this work, you can check out their page to get the answer to your question! Cabinet height - Hi can you please tell me the height of your glass cabinets? Thank you. Bench top material - Hi, can you tell me what kind of stone you used in this kitchen? 11. 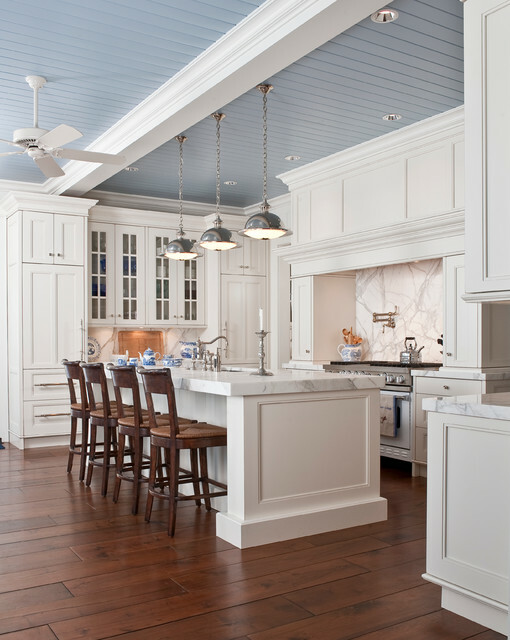 A blue panelled ceiling transforms this white kitchen into something truly special, while marble surfaces add a sense of opulence.